The maxillary nerve is the second branch of the trigeminal nerve, which originates embryologically from the first pharyngeal arch. Its primary function is sensory supply to the mid-third of the face. 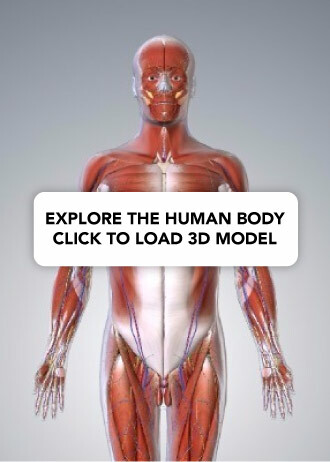 In this article, we shall look at the anatomy of the maxillary nerve – its anatomical course, sensory and parasympathetic functions. At the level of the pons, the sensory nuclei merge to form a sensory root. The motor nucleus continues to form a separate motor root. These roots are analogous with the dorsal and ventral roots of the spinal cord. Within the middle cranial fossa, the sensory root expands into the trigeminal ganglion (a ganglion refers to a collection of the nerve cell bodies outside the central nervous system). The trigeminal ganglion is located lateral to the cavernous sinus, in a depression of the temporal bone known as the trigeminal cave or Meckel’s cave. The motor root passes inferiorly to the sensory root, along the floor of the trigeminal cave. Motor fibres are only distributed to the mandibular division (V3). 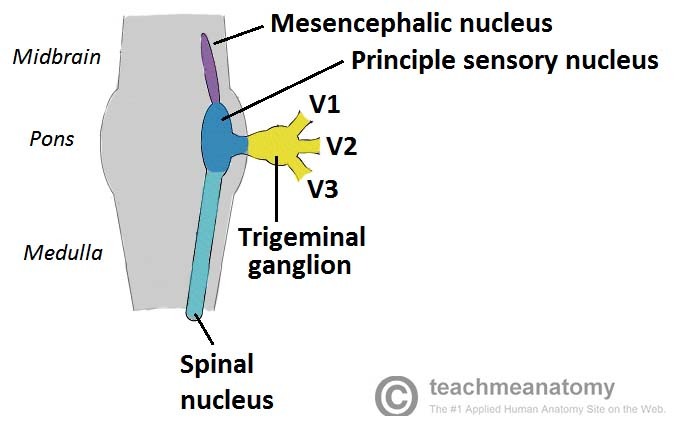 From the trigeminal ganglion, the three terminal divisions of the trigeminal nerve arise; the ophthalmic (V1), maxillary (V2) and mandibular (V3) nerves. Fig 1 – The origin of the trigeminal nerve. Note that the nuclei are situated within in the CNS, and the gangia outside the CNS. Fig 2.0 – Cutaneous distribution of the sensory supply of the maxillary nerve shown in blue. As such, light touch can often trigger episodes of excruciating pain. Its cause is unknown but it is thought to be the result of damage to trigeminal nerve due to conditions such as multiple sclerosis, stroke or trauma. The pain is usually unresponsive to typical analgesics including opioids. As a result an anticonvulsant such as carbamazepine is often used to reduce nervous transmission of the pain by blocking active voltage gated sodium channels. If unresponsive to pharmacological agents, surgical destruction of the nerve is possible, but that understandably results in loss of sensation over the face. Fig 3.0 – Distribution of the trigeminal nerve’s branches. 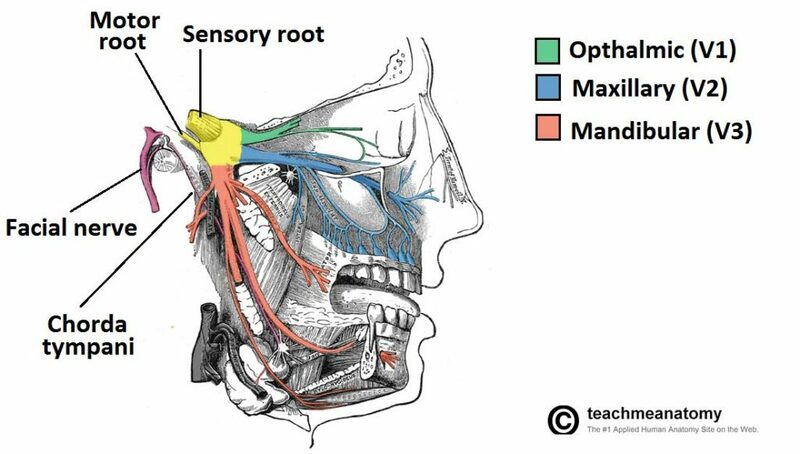 Which foramen does the maxillary nerve pass through? 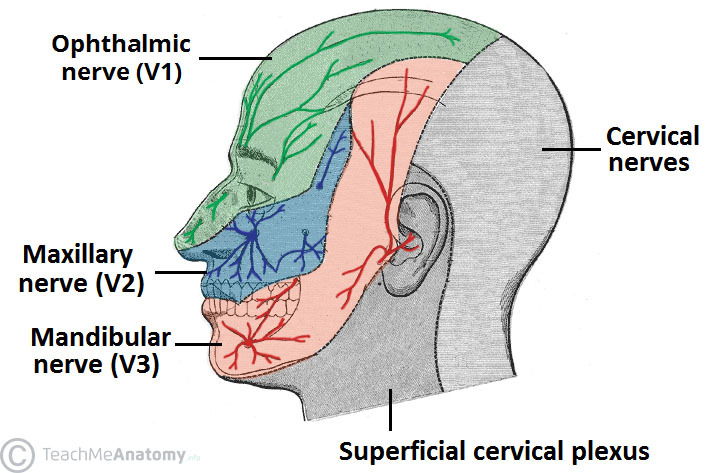 Which of these areas is not supplied by the maxillary nerve? Which of the following structures are innervated by parasympathetic fibres hitchhiking on the maxillary nerve?